Posting from my phone is still awkward, sorry! I’m currently in my tent in a city park in Eureka Montana. It’s 10:30 pm and there are air horns and sirens everywhere, but I have no idea why. If I learn anything by the end of this note, I’ll let you know! I’ll start by saying this is a trip of a lifetime. Our group is just superb and the ride simply could not be better. I’d be lying if I said I didn’t hurt all over and I struggle up many of the simply massive climbs, but I just have to look out into the snow-capped peaks of the Canadian Rockies which surround me at all times, and all that becomes irrelevant! I guess I’ll start at the beginning. Leslie is a dear friend I met when I rode the trans-am cross country route in 2010. I am honored and so pleased to be riding with her again this year. Never have I laughed so hard! Roger and John are from Ohio and have been friends for several years. While they are a generation apart in age, they make a true dynamic duo and I am very pleased to be riding with each of them. The four of us truly make the perfect Divide Team! Roberta is from Hawaii and started out with us but split off after 3 days to ride with another couple riding the same route who she had also connected with online before the trip. Day One: Banff Alberta to Marble Canyon BC. This 34 mile ride was a great intro to the trip. It had several long, steep climbs but we were feeling strong. For a quarter mile or so we followed (at a safe distance!) a coyote trotting down the road. It eventually ducked into the woods to let us pass and then started back out along highway 1a, following far behind. Even the coyotes are nice in Canada!! Earlier this spring my knee started bugging me on longer rides and while I kept making slight bike adjustments I hadn’t quite got it under control. By the end of day one, my knee was killing me! Luckily, I had some Advil that got me through. I was glad to stop for the night at the Marble Creek Campground even though it was a shortish first day. On the advice of the campground host we hiked a few miles up into Marble Canyon. The area was in the midst of a 400 acre forest fire burn from 2003 and was scattered with hundreds of dead but still standing trees. It was cool to see the cycle of how the fire made way for the landscape to rejuvenate itself. We hiked up along the canyon which a small river had dug hundreds of feet down into the rock. With a huge falls at the top and the opening often only a few feet across, there were many places you couldn’t even see the river down below. While we were out, Roberta wandered down along a different creek and saw a black bear in the distance. We reported the sighting to the hosts because they close the campground if there is a lot of bear activity. Day 2 – Marble Canyon to Red Streak Campground in Radium Hot Springs. This 58 mile ride was split fairly evenly in thirds: 20 miles long gradual down followed by a 20 mile long climb (for those of you in Calais, picture Montpelier to Morse Farm for 20 miles!) then a long, steep descent. The climb led to unbelievable views from countless turnoffs at each switch back. I downed tons of water, put it in my lowest gear, and just chugged along. I tend to be a slower climber than the rest of my group which can be frustrating at times, but they assure me they don’t mind sitting around eating cliff bars at the top! Whenever a climb is hard I just look around – it’s amazing how much energy I draw from the beauty that surrounds me. At the top of the long climb we saw a momma black bear and her cub walking through the grass on the opposite side of the road. Not wanting to startle them we just kept chugging right along and I’m not sure they even saw us. After a long and very steep descent we entered Radium Hot Springs where we ate ice cream and soaked in the hot pools for several hours! We saw a big horned sheep up close and personal, as well as several others high up on the rocky cliffs above. The 2K very steep ride up to our campground was hard after the deep relaxation of the pools, but was well worth it for the views out over a huge wetlands area. 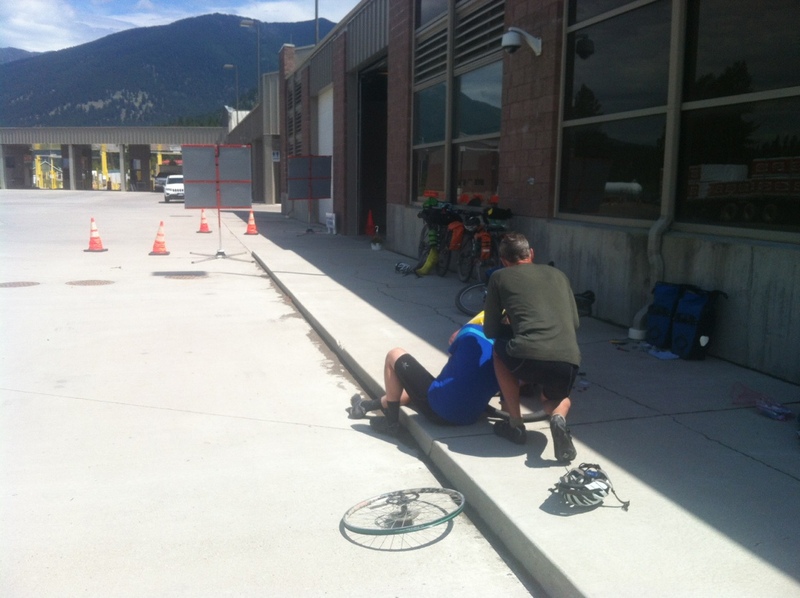 Day 3: Radium Hot Springs to Wasa Lake. This 70 mile day went super smoothly. I was feeling my strongest yet and climbing well. With some Advil my knee wasn’t too bad though it still had me worried. I get occasional shoulder and wrist stiffness, but overall am usually quite comfortable. We saw yet another gigantic nest with a momma osprey feeding her babies. At lunch in a sleepy village park I took John’s advice and slid the cleats (the thing on the bottom of my shoe that clips to my pedal) back an 1/8 of an inch towards the ball of my foot. This tiny adjustment has virtually eliminated my knee pain!! Yeah John! I also played with my odometer which I think had been set to the generic 29er wheel size but was off a mile out of every 21 on my bike. Luckily, Roger has the same tires as me and remembers their circumference to the exact mm! I reset my odometer and now it’s perfect. The 200 ish mile highway detour we are taking due to the Alberta floods has turned out to be in many ways ideal. It’s a way to ease into the climbing and long riding days and also gets us a chance to dial in our gear. Perfect in every way! Day 4: Wasa Lake to Baynes Lake. 62 miles. I had a slow morning as the hours and hours of climbing each day were catching up to me, but by lunch time I was back in shape and climbing well. Because we are on roads, we have been by stores every day to pick up cold drinks and lunch foods. We’ve been eating our share of ice cream and enjoying this convenience while it lasts. This will end now as we are about to head deep into the wilds of Montana! Due to the recent flooding, there has been a lack of potable water at most campgrounds we’ve stayed at. I’m so glad I got a SteriPen for Christmas (thanks Mom!!). This is the easiest and fastest water purifying system we have with us and have used it almost every day. This was Roberta’s last day with us, she camped with the other couple she knows and they left before us this morning. It seems likely we’ll keep bumping into them along the way! This was also the day we left the pavement and officially rejoined the great divide trail! One of my panniers quickly rattled loose crossing the first of dozens of cattle guards! I have a very old cheapo set I knew I should have replaced but didn’t…. live and learn! I’ve ordered a new pair and will pick them up thursday in Whitefish, Montana. They are bright red, I can’t wait! John, Roger, Leslie and I spend hours a day laughing and carrying on, I simply can’t think of a better group to be doing this with. The entertainment never ends! Day 5: today, 40 miles. Fairly short day with only a handful of climbs. Slower going now that we are on route and switching from one tiny dirt road to the next every few miles! At one point the thunder and dark clouds rolled in but we waited it out at a cute little store and it mostly blew by us. First full day of riding with no knee pain, yay!!! Leslie had our first flat of the trip today and topped it off a few times before breaking to change it out at the border. Her tires are less knobby than the rest of ours which has been great on the pavement but she may swap them out in Whitefish if she has any more trouble. 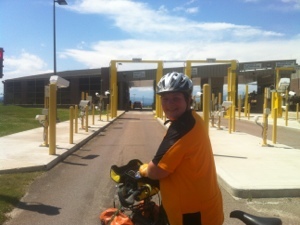 It was my first ever international border crossing on a bike, but they are used to it there and it went perfectly smoothly. I confirmed my panniers would be in on Thursday while Leslie patched her tube. Another 12 miles and we rolled into Eureka. There is another large cycling group here headed north who gave us 2 bottles of wine that they didn’t want to carry tomorrow. We drank one tonight and will take turns carrying the other up over Whitefish Pass tomorrow, by far our largest climbing day yet! Now it’s late and we get up early. I know I’ll fall asleep dreaming of good memories of our dear John Connell whom we lost a year ago today. I’ve been thinking of him and of course his dear Josie, Georgia, Silas, and Sierra all day long! So much love sent their way! The sirens have ended as has the annoying loud generator the camper next door ran for the last 4 hours. So thats all for today, I’ll try to write again on Thursday when we get to Whitefish. Way to go Jamie. If Advil is helping and you want something longer acting, you might try Aleve (sodium naproxin). It lasts twice as long and has seen me through many a ski day (including some you were part of!). Thanks David! I think on closer inspection it was actually Aleve I was taking and I was amazed how it lasted all day. Luckily my knee problems seemed to have been resolved by re-positioning my cleat, so I haven’t needed any for a few days!